Cancer constellation is located in the northern sky. Its name means “the crab” in Latin. 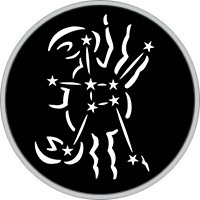 Cancer is the faintest of the 12 zodiac constellations. Its symbol is ♋. The constellation was first catalogued by the Greek astronomer Ptolemy in the 2nd century. Cancer contains a number of famous deep sky objects, among them the open cluster Praesepe, also known as the Beehive Cluster (Messier 44), the open cluster Messier 67, and the interacting spiral galaxies NGC 2535 and NGC 2536. 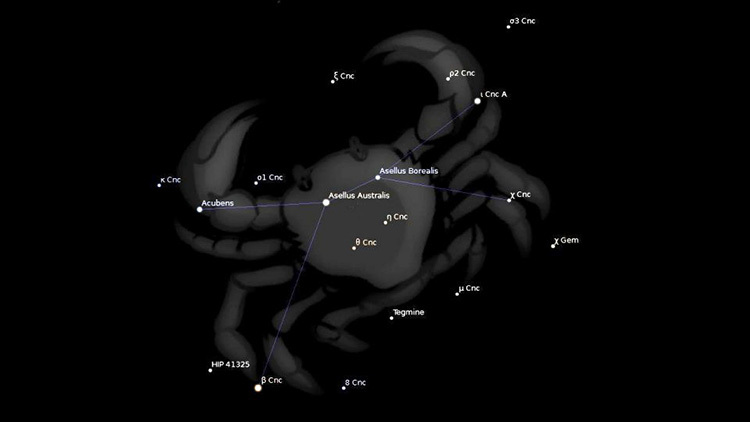 In mythology, Cancer is associated with the crab in the story of the Twelve Labours of Heracles (represented by the Hercules constellation). In the myth, Hera sends the crab to distract Hercules while the hero is fighting the Lernaean Hydra, the serpent-like beast with many heads and poisonous breath, represented by Hydra constellation. When the crab tries to kill Hercules, Hercules kicks it all the way to the stars. In another version, the crab gets crushed instead and Hera, a sworn enemy of Hercules, places it in the sky for its efforts. However, she places the crab in a region of the sky that has no bright stars, because despite its efforts, the crab was not successful in accomplishing the task. Cancer does not have any stars brighter than fourth magnitude. How to find the constellation Cancer in the sky? Cancer is the 31st biggest constellation, taking up an area of 506 square degrees of the night sky. As far as its shape goes, it looks nothing like a crab, but appears more like an inverted ‘Y’, representing the crab’s back. The famous Beehive Cluster (M44) located in the centre of the constellation also helps in identifying the constellation proper. Cancer is a northern constellation that can be seen by observers located between latitudes of +90 and -60 degrees. The easiest way to find Cancer is to look for it between the two striking constellations of Gemini to its west, and Leo to its east. A number of other constellations also border Cancer, including Lynx to the north, and Hydra and Canis Minor to the south. Cancer is a winter constellations that in the northern hemisphere is visible from late autumn to spring, although best seen in March. In the southern hemisphere, it can be viewed in the summer and autumn months.